Alright, we know what you might be thinking. "ANOTHER puzzle game? Wasn't Ghostlop enough?". Well... Ghostlop might usually be classified as a puzzle game, but honestly we feel it was more of a competitive Breakout/Arkanoid-style game than a "traditional" puzzle game. We think there's enough cause to include a traditional single-player puzzle game in K10, and what better than to honor the most popular puzzle game ever created - Tetris. 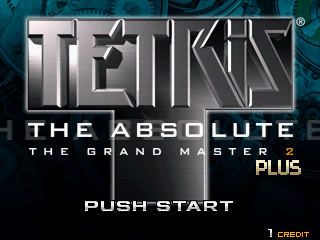 The Grand Master arcade series by Arika is often heralded as the definitive arcade versions of Tetris - lenient controls that let you slide and rotate pieces around before they immediately get "stuck", and expert modes of play to challenge the most dedicated of Tetris players (which have made for some very impressive superplay videos you may have seen floating around on the internet). The Grand Master 2 Plus has 5 modes of play. Rather than just picking one, there will be 3 modes used for the finals of K10. Normal Mode is pretty standard stuff - it's a refreshingly easy mode where you can focus on setting up 4-line Tetrises. And you will need to score as many as possible, because a game of this will only last around ~5 minutes - when you reach "Level 300/300", the game is over. Master Mode, on the other hand, is a true challenge. The pieces fall much faster, and continually speed up (although they give you a partial break at one interval before returning to its blistering speed)! Clearing this mode is very, very difficult unless you're a Tetris master. If you can't clear it, how long can you survive...? TGM+ Mode is pretty similar to Master Mode in terms of speed but with an added twist. After certain amounts of time have elapsed, the screen will be pushed up by a row of blocks at the bottom with just one gap. This can force you to start re-building so as not to keep covering up the gap if you have pieces over it, but while you're doing that it's likely ANOTHER row of blocks will come up from the bottom too. 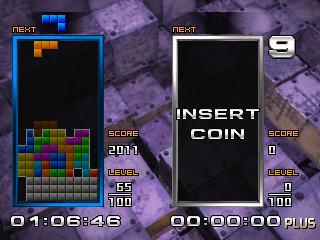 Is it worth trying for Tetrises at all in this mode, or should you play for survival? We will *NOT* be playing the final two modes - T.A. Death and Doubles. T.A. Death is even more ridiculous than Master, and Doubles might be an interesting challenge in theory to make one person control two pieces at once, but it feels too gimmicky. So to reiterate, players will be required to upload on the following modes - Normal, Master, and TGM+. The winner of the finals will be the player who obtains the higher score on at least 2 of the 3 modes (no, the score will not be cumulative across all 3 modes). Please upload each mode as separate inps, as usual. RAX@AIVA  and colman paolo  will be battling it out to determine the MARP Knockout 10 champion! nii-san  and *Goldtimes*  will be playing for 3rd place. Congrats to the players that made it this far, now good luck! But honestly... I can understand if you don't want to upload to MARP, seeing how the main site is still having slowness issues. We'll allow recording uploads as attachments to this thread for the finals, since it would probably be a lot faster. Correct and playback works fine. Goldtimes wrote: I'm sorry. Unfortunately I couldn't play this week. Congratulations to Paolo Colman, the Knockout 10 Champion!